Pattern: Norwegian Mittens from Knitter's Almanac by Elizabeth Zimmermann Yarn: Knitpicks Telemark, Icicle (2 balls) and Aubergine (1 ball - just barely made it!) Needles: US 3 DPNs Recipient: ?? Notes: It's no secret, I have made a few pair of glittens, , gloves, and other handwarmy items in my short career as a knitter*. Handwear are perhaps the knitted item appreciated the most by the naturally cold of digit (moi), and as projects are relatively brief, interesting, and portable. Call them the sock's hipster cousin, if you will. I do. These have been my go-to project since I started working and have limited knitting time, mostly on a crowded B train. They still took quite a long time since they were frogged not infrequently. Oh, and there were those two separate days when fellow subway riders asked me to please put my knitting away for fear they would be injured by the DPNs. Seriously. I had no idea exactly how uptight this rush hour crowd was until then. No friggin' idea. These mittens are classic Elizabeth Zimmermann - she describes the Norwegian mitten archetype, and gives a pattern, which you see here, but really the "recipe" is yours to use for whatever pattern you like. Next time, I'll create my own motif, now that I am confident in the general idea. This pair is too large for me, but I've a holiday recipient in mind who does not read Fig and Plum. As the person drives an automobile, I am contemplating tricking out these mitts with suede patches on the palms to provide some friction. Mittens are a great refresher course for colorwork. I hadn't done any since my last project out of Norway. The tension was all over the place as this project progressed, partly because my stranded knitting was rusty, and partly because I kept misplacing DPNs from the Crystal Palace set I was using and eventually replaced them with a different brand's US 3 that was, I think, .25 or .5 mm larger somehow. Why can't we just size by the millimeters? Also, the first time 'round I placed the thumbs too high on the palm - even my short fingers were hitting the tip of the mitt. I ended up frogging and re-knitting the mitt portion of both hands before they were acceptable. The one disadvantage of these is the positioning of the thumb. From what I can tell, it's a structural quirk common to all Norwegian mitts that the thumb is placed aligned straight beneath the palm (think: sock puppet). The human hand, of course, more frequently includes a thumb sticking out at about a 45 degree angle from the hand. While it may detract from the symmetry of the back of the mitt, I prefer my thumb to jut out proudly at its natural angle, rather than be forced into some kind of permanent-shadow-puppet stance. Now: Telemark. In short: fantastic colors (keep this up, Knitpicks! It's a drastic improvement. ), acceptable quality, and cheap as chips. It's not the softest - I think Elann's Peruvian Highland Collection is softer. I preferred working with Dalegarn Baby Ull, which is smoother and superwash, but I'm not complaining about $6 mittens that seem durable. There are about 10 more balls of this in various colors sitting in my stash, poised to become colorwork hats and handwear. Normally I feel guilty about unassigned yarn, but (a), this is generally devoted to small colorwork projects and (b), who feels guilty about a $2 ball of yarn sitting unused? I have bigger things to beat my breast about (like that 1.5lb cone of cashmere-merino from School Products). * I have just thought of a word for someone like me. How about "mitteneer"? ** "a happy salmon." If you are Norwegian and this really means "bat guano" or something, please kindly let me know! Gorgeous! I love the color combination. I know what you mean about the way the thumbs are on Norwegian mittens...when I knit my most recent mitten, I decided to have the thumb gusset grow out the side of the mitten, placing it in the middle of that alternating pattern that runs up the sides of the mitten, so that my thumb can happily jut out at its natural angle. Those are some glor-ee-ous mittens! The color combo is great. I am already contemplating my own pair. Love 'em! Those look awesome! The colors go together well. Oh so beautiful! Mitteneer indeed! i was thinking about knitting up some Norwegian mittens but, i think the sock puppet-ness of it all kinda makes me a wee more iffy about the idea. eh, we'll see. your mittens are gorgeous. very nice work, indeed. and i'm gonna have to try out some of that telemark now. I, too, like the thumbs on my mittens to be off to the side. But I still love how those turned out. I have some telemark coming my way for my own pair! Nice job - you colorwork looks great! Rusty or not, you did an awesome job! I really like the colors you chose. That's so funny about the thumbs. They came out beautifully! Someone's going to be happy this holiday season! Great job on the mittens! Gorgeous. they look great! and really? people asked you to put away your DPNs? that's so strange. i would be flabbergasted. i'm always tempted to tell people to stop clipping their nails or sucking on their teeth but i never say anything! how did you handle it? I believe the word you want is ærefryktinngytende. Don't ask me how to pronounce it! Those are beautiful mittens. Lovely photos, Jess. You're too cute!!! The mittens came out great! Awesomer, so wrong but so the right word sometimes. I think I might give these a go... I just bought myself a new black coat who need fun mittens to go with! 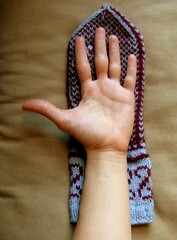 Great mittens, great photos, and good point about the Norwegian thumb. oh chica... those are beautiful. great photos too! i love the idea of putting the suede on... very nice touch. Gorgeous mittens! I feel myself posed at the brink of Mitteneer-hood (Mitteneer-ness?) Love the color choices, and thank you for the yarn review -- I've been eyeing it myself. I hope that you didn't actually put the DPN's away at the request?! Would you mind saying where you ended up placing the thumb on the palm? You've inspired me to try these. And I love your Fig + Plum banner...the colors! How am I going to keep knitting my sweater and not cast on for mittens immediately? I have much unassigned Telemark, too. Wow! Those are impressive. I love them. I understand that the thumb placement is not anatomically correct, but if you moved it sideways, wouldn't it get in the way of the pattern? Hmmm, I wonder how you're going to solve this one! wow... they are great... i love your color choices too! I think this is just what i needed to see to try my first fair isle project!! Mittens are the perfect canvas for that! Beautifully done! Those are SO COOL! I love 'em. Thanks for the little review of the Telemark too, I was wondering how it was. They are beautiful! I may need to make a pair in the same colors for myself! These are just gorgeous! Lovely work and wonderful color combo! Rockin' mitts! And thanks for the clarification on thumb placement. I knew there was something bothering me about the Norweigan mittens phenom, but couldn't place my...finger....on it. I really like the color combo you chose. The suede patches are a great idea! They are fabulous Jess! You are making me feel guilty about my "second mitten syndrome" though. Beautiful, beautiful!!! I love these mittens--yours were the inspiration to make mine. And I love your color choice as well--here's to Knitpicks' best choices yet! Gorgeous. Simply gorgeous. I really, really need to buy that book. Those are cool! I love the color combination. Happy belated Birthday!!! Awesome mittens. You inspired me to buy the Knitter's Almanac. Lovely mittens! I heart the color combo. seriously? two someones asked you to stop knitting on the subway? amazing. I should knit with dpns more often just for the hilarity factor. and the mittens are gorgeous! I may have to knit those! Wow, those are inspiring! I'm inspired to finish my pair-in-progress (similar, but from Folk Mittens) and start a pair of these...I love the EZ book so much. I really like the long, long cuff on these. I love the reverse s shapes on the cuff - it's classicly elegant and folksy like. Nice job! Ok, I know it's blurry, but I really like the "artistic shot" and I can't believe fellow commuters really asked you to put the dpns away! Wow. Were they at least nice about it or narky? That would really depress me about the state of the world if that happened to me. Those beautiful mittens will surely be able to keep your hands warm this winter! I've never thought about the placement of the thumb before. But living in cold Sweden I've a lot of experience of wanting to have my hands warm. And am thinking ... perhaps the thumb is placed there to keep fingers more "gathered" in order to be able to warm the whole hand better???!? Your mittens turned out super lovely! Are you going to try a different thumb placement next time? I can't believe 2 people were afraid of your dpns! Another example of people who fear what they don't know. Silly! The mittens look great! I've been thinking of knitting those in a similar color combination, so it's nice to see how good it looks! I'm with you on the thumb placement--it's one of the reasons I haven't started this pattern yet. There's gotta be a way to modify them. Hmmm . . . .
Those mittens are gorgeous. Gorgeous! My aunt likes to refer to a precocious child as a "fart in a mitten" - think about it...have you ever tried to contain a fart in a mitten? The mittens are gorgeous. I've been fiending to knit mittens for awhile now. I should really start. I take the B train to and from work too! I'm shocked that people asked you to put the knitting away. If someone asks you to do that again tell them it keeps your mind off the voices that tell you to kill. Maybe they'll move then! 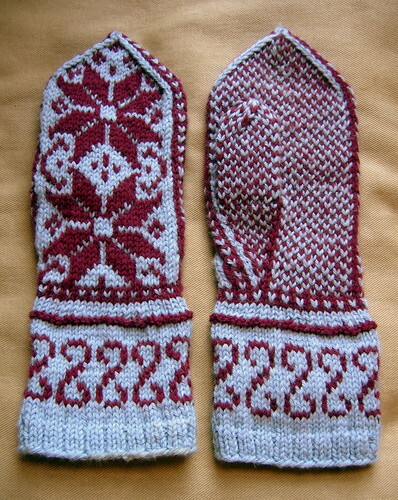 As for the thumb thing, do you have access to Anna Zilboorg’s Magnificent Mittens? She has directions for an invisible thumb, gussetted thumb, and a "sore-thumb". A lovely book. These are so beautiful. I've been hankering for some colorwork, have yet to make mittens and have some very cold hands the last few days. It may be time for a knitpicks order. Holy crap, you are the Mitteneer Extraordinaire! They're fantastic! Your mittens are great. I also knit on the subway and have run into the overly cautious. I think they really just want to mess with someone and a knitter seems harmless. Once in the early eighties a woman standing five feet away from me and my circs complained. As there was obviously no threat I started following her around always at the five foot mark. She got off at the next stop. I don't know if I would go that far again now that I'm in my forties, but it was very satisfying. great mittens, you mitteneer you! and what a bunch of sour pusses on the train in the morning! don't they know DPNs only look menacing? These are some beautiful mittens! I decided to knit them, too. Great job! Congratulations! The colors and patterns are beautiful. Absolutely georgeous mittens! I especially like the thrift shop paintings in the background of one of the photos. I am a collector of paintings like that. You always have excellent photography (your Morocco pictures rendered me speechless -- those blues!) I think I am delurking, don't recall commenting before. 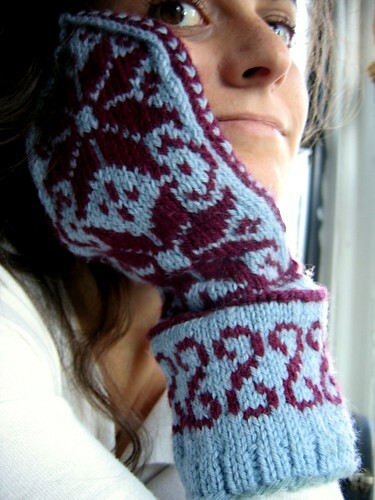 http://www.helylle.se/selbu.html, you will find more Norwegian mittens, aka Selbustrikk ( Selbu knitting). I've knitted some of the mittens my self. And the tanslation are perfect! Jess, these came out great! How beautiful! I really like the photography as well. Great job! Those are gorgeous. I love the colors you chose - that's probably one of my favorite color combinations. I'm so impressed with the colorwork. I've never done any myself - I'm going to have to take the plunge at some point, since these mittens are great, and I loved your Norwegian stockings, too. Absolutely beautiful work! How on earth could you give those away? I hope the recipient really appreciates all that effort at least! Hope the job is going well! Hi I love this color combination. I am going to make a yolk sweater that Wendy at Knit and Tonic designed. I would like to us the blue as a base and the wonderful aubergine, and I need three other colors ??? Any ideas? There are photos of the sweater on her blog. Jess, they are fabulous. Just fabulous! It's funny how knit picks is hit or miss, they definitely rocked on this yarn. Lovely colors, btw. 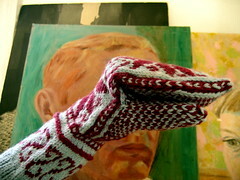 I am also in the midst of a love affair with Norwegian mittens, yours are fantastic! I ran across your site as I was looking for "Norwegian Mittens". Love the pics and the pattern and the whole ball of wax, you did a great job. I'm not a knitter, but I am part Norwegian, and I live in Minnesota! So these are inspiring and want me to learn how to knit! Can you tell me where I can find the pattern, exactly what book by Elizabeth Zimmermann? Thanks so much! Feel free to email me the info if you have time, would love to know about these mitts. To promote business, we are looking for new resources where we could sell our quality products, and because of being self-manufacturers we can offer unbeatable prices with top quality workmanship. In view of that we would like you to give us a chance, so you will be able to compare our quality products in the market. However,we are absolutely confident once a chance be offered to us even against your inquiry, you will not be able to deny us a business opportunity. manufacturers and exporters of motorbike gloves and sporting goods, motorbike gear, motorbike gloves. We are busy in manufacturing motorbike Equipment all kinds of promotional gloves from many years and supplying worldwide. Haha :D Glad laks. It does indeed mean happy salmon, and it's a beautiful expression. So are your mittens. I love these, but as you say, the thumb is quite uncomfortable :/ we norwegians must have had weird hands once upon a time. If you are willing to buy real estate, you will have to receive the personal loans. Furthermore, my mother always uses a sba loan, which occurs to be the most firm. My gram gram knits those way better than you can you don't know what your talking about!she is the WORLDS greatest gram gram! She lives in coos bay Oregon.